The XE195 is the base model in Spirit Fitness' elliptical lineup, with some nice features including a generous stride length and narrow pedal spacing. Although not the most popular brand, the company does make some solid cardio equipment. The Spirit XE195 is silver and black, with a 7.5" LCD display giving you all of your relevant workout stats. Check out this popular elliptical at the company store! 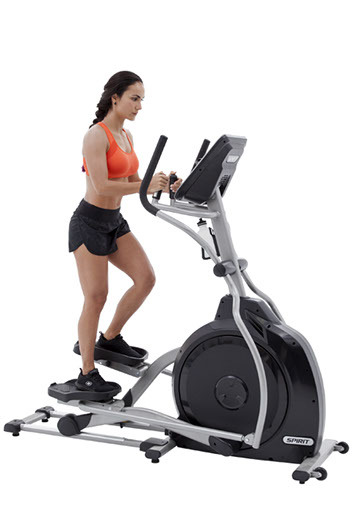 Spirit ellipticals are very well made, with a lot of thought put into the design and functionality. You'll find them in specialty high-end retailers like Leisure Fitness and Gym Source, alongside other top brands like Life Fitness, Matrix and Octane. The XE195 is their base model, at around $1299 on sale, and has some nice features. For starters you get a nice 20" stride length which is ideal for most users. Pedals are spaced 2" apart with a 2 degree inversion, which puts you in the most ideal position. The display is basic but functional, with 11 metrics such as resistance level, time, program, laps, speed and heart rate. You can also change the angle on your console with is something you don't typically find. You can choose from six workout programs: manual, hill, fat burn, cardio, strength and interval. The higher end models have a few more, with the XE795 having the most, 12 altogether. You can measure your heart rate via the handle grips or wirelessly, but the wireless chest strap is not included on this model. You get 20 resistance levels, which you can adjust via the handles. The Spirit XE195 is relatively compact, with a max user weight of 350 lbs. The warranty is decent, and you get a fan on all of the Spirit ellipticals. Any shortcomings? It would be nice to get a few more programs, especially since other $1000+ models tend to have more built in. Also, there is no workout tracking, which is another nice feature that most of the higher level models do have. Still, it is a solid no frills elliptical trainer that is worth considering in the price range. The XE195 is a decent choice, although not the most exciting elliptical trainer on the market. It's more about the design than anything else. The inverted pedals are one of the main USPs, as they put you in the most ideal position. You also get a nice 20" stride and a few programs. For basic home use, this one could work for you. Also take a lookl at some of the higher end models for tracking, free wireless chest strap and more workout programs.